In a nutshell, there’s nothing about the Mobvoi TicWatch E2 that you haven’t seen before. It has a 1.4-inch AMOLED display and a bulky 13mm case. It’s water-resistant up to 50 meters so you can take it swimming, and it has a heart-rate sensor. It’s powered by the Snapdragon 2100. It has a respectable 415mAh battery, and it runs the latest version of Wear OS. What’s impressive about the TicWatch E2 isn’t its specs or features. It’s not even anything it does. 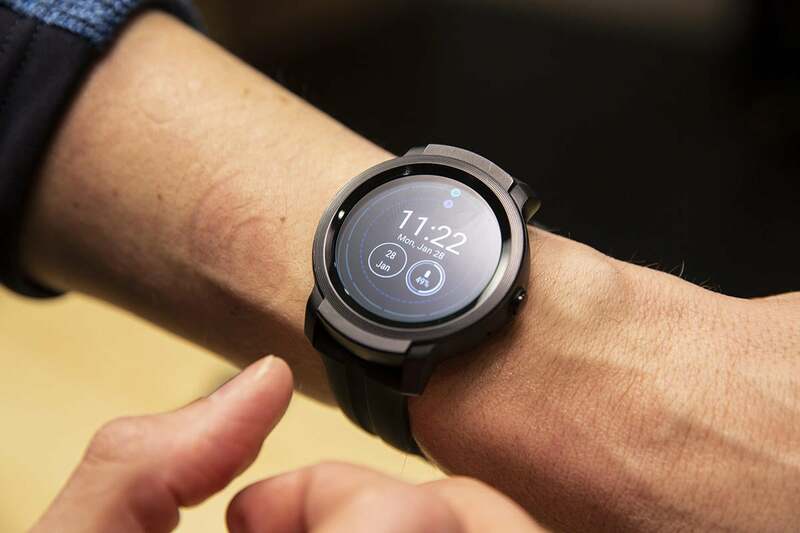 It’s that for $160, you can get a Wear OS device that has all of the latest software features, dutifully tracks your steps and exercise, lasts all day, and looks like a watch that costs a hundred dollars more. While we’ve been waiting for a Pixel Watch or some other high-end Wear OS device to challenge Apple Watch at the high end, Mobvoi has done something Fossil, Huawei, and Samsung haven’t: Made a full-featured Android smartwatch that’s practically an impulse buy. Unlike the playful translucent model it replaces, the Mobvoi TicWatch E2 is entirely ordinary. The device is dressed in all-black, with no available color options. While the darkness gives the E2’s bezels a somewhat slimming aesthetic, like nearly every other Wear OS watch, it’s a bit on the big size. At 13mm it’s a touch thinner than its predecessor but still chunky overall. The E2 is pretty thick, but we’re used to that. The E2’s plastic body, while extremely light, has a sheen that’s somewhat reminiscent of the finish on more expensive metal watches. The silicone band has a soft, almost leather-like feel, and it’s comfortable to wear all day, even during long stretches of exercise. Compared to other sport straps, the TicWatch E2’s band is more breathable and didn’t leave any sweat rashes on my wrist when wearing it tightly, as I tend to do. The 1.4-inch AMOLED screen is bright and crisp, and looks particularly good with Wear OS’s new system-wide dark UI. An embossed bezel around the screen adds a touch of style, while a chamfered edge makes the whole package seem slimmer than it is. Rounding out the relatively minimal design is a solitary button that either launches the app screen or returns to the watch face, depending on where you are. The TicWatch E2 runs the latest version of Wear OS, so you get the new Assistant feed screen, Google Fit face, and general UI improvements. It’s not a huge revamp, but it makes a big difference over the TicWatch Pro I tested last year, even though both watches use the same long-in-the-tooth processor. The E2, right, is newer than the TicWatch Pro but it has the same aging processor. 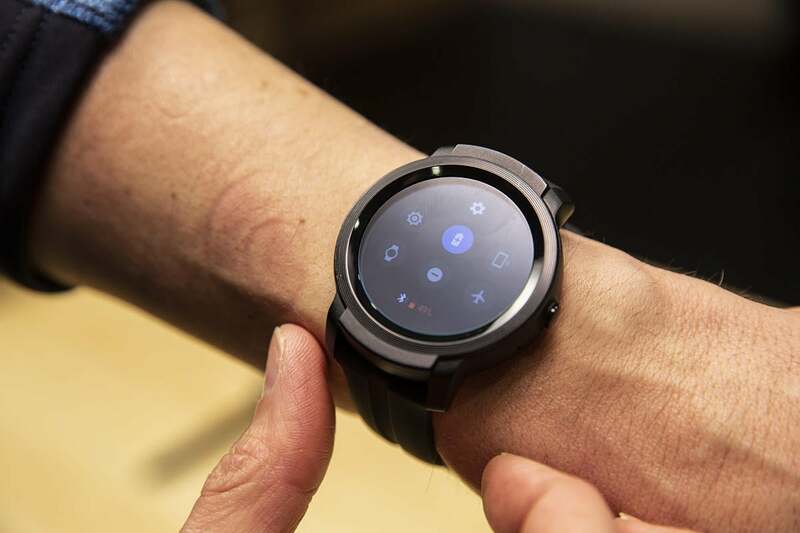 Google’s transition to Wear OS has made a point of improving the viability of older hardware, namely devices powered by the Snapdragon 2100 chip. As a result, swiping and scrolling on the E2 feel more natural than they did under Android Wear. 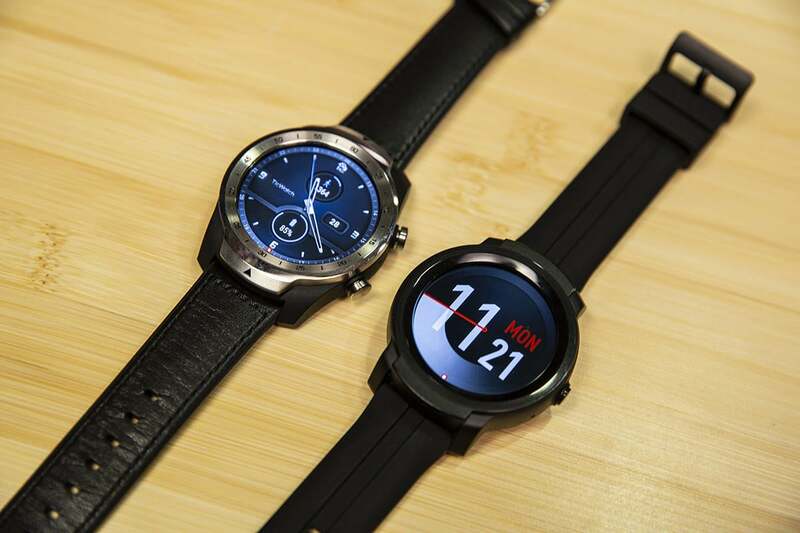 Additionally, the new Assistant-powered feed and Google Fit shortcut to the left and right of the face, respectively, cut down on the need to launch apps constantly, but Wear OS is still very much in need of a top-to-bottom overhaul. It’s when you need to launch an app that the TicWatch E2’s processor shows its age. The updated platform can compensate for only so much; tapping an app to open it consistently took at least a second or two and exhibited clear lag even after a reset. Screenshots took forever, and simple tasks like returning to the watch face were just as painfully slow. After a few days, I found myself avoiding apps altogether as a result. But while the TicWatch E2 would surely benefit from the newer 3100 processor, slow app launching is hardly a deal-breaker for the E2. Unless you buy an ultra-discounted Moto 360 on eBay or a sensor-challenged hybrid, you’re unlikely to find a $160 smartwatch that does as much as the E2 or lasts as long. The E2 doesn’t have Mobvoi’s “Essential” battery-saving mode, but it will last a full 24 hours. Nearly every Wear OS smartwatch promises “all-day” battery life with everything active (continuous heart-rate tracking, always-on display, etc. ), but the E2 is one of the few that consistently delivers true 24-hour battery life without sacrificing features. Actual all-day battery life might not seem all that necessary when you’re only awake for 16-18 hours a day, but it will matter once Mobvoi pushes sleep tracking on the E2, a rarity among Wear OS watches. The company says the feature will include automatic sleep detection once the over-the-air update arrives, so that extra battery life will certainly make a difference. Unfortunately, however, you’re not going to be able to push the E2 too much longer than a day or so, as it doesn’t include the same impressive battery enhancements found on the TicWatch Pro. On that model, there is a unique second screen that lets it literally last for a week, but the E2 only has a standard Battery Saver toggle that sacrifices the always-on display, haptic feedback, Wi-Fi, and other features for a couple hours of battery life. Mobvoi could squeeze out a little more time by implementing a night mode that shuts down raise-to-wake and notifications overnight, but as it stands, my watch consistently bothered me in bed. For swimmers, the TicWatch E2 is also rated for 5 ATM water resistance, meaning you can dunk it in 50 meters (165 feet) of water. Mobvoi has also built in automatic detection for swim style, laps, and running, but it doesn’t extend beyond those two activities. A lengthy spin class went completely unnoticed by both Fit Workout and TicExercise, though the watch did a fine job of tracking my motion and steps throughout the day, thanks to its continuous heart-rate monitoring and on-board GPS. The Mobvoi TicWatch E2, far left, is one of the few Wear OS watches that doesn’t have an NFC chip. For my money, I’d rather have NFC than GPS, especially because there’s a Sport variant with a count-up bezel for $20 more. GPS might make sense on that model, but it’s a little unnecessary here—the lack of LTE means you’re probably going to have your phone around anyway. As it stands, you can’t use Google Pay with the E2, which will likely keep some people from buying one. Mobvoi warned me of “inconsistencies” with its heart-rate, and a promised update to fix it didn’t arrive before I finished reviewing it. When I manually checked my pulse, it seemed pretty accurate. What wasn’t, however, was Movbvoi’s TicMotion tech. Whether it’s the result of the wonky heart-rate monitor or the misreading of other sensors, my numbers were all over the place, with steps occasionally not getting counted at all, exercise sessions not registering at all, and calories burned showing wildly inaccurate estimates. So you’ll probably want to stick to Google Fit for fitness tracking. Should you buy a Mobvoi TicWatch E2? If you want to make payments with your watch, then you should spend your money elsewhere. There are loads of Wear OS watches with NFC chips on board, including the Mobvoi TicWatch Pro, which has all of the same features as the E2. The Mobvoi TicWatch E2 cuts a giant profile on your wrist. But if you don’t mind taking your phone out of your pocket to use Google Pay, it’s easy to recommend the TicWatch E2. 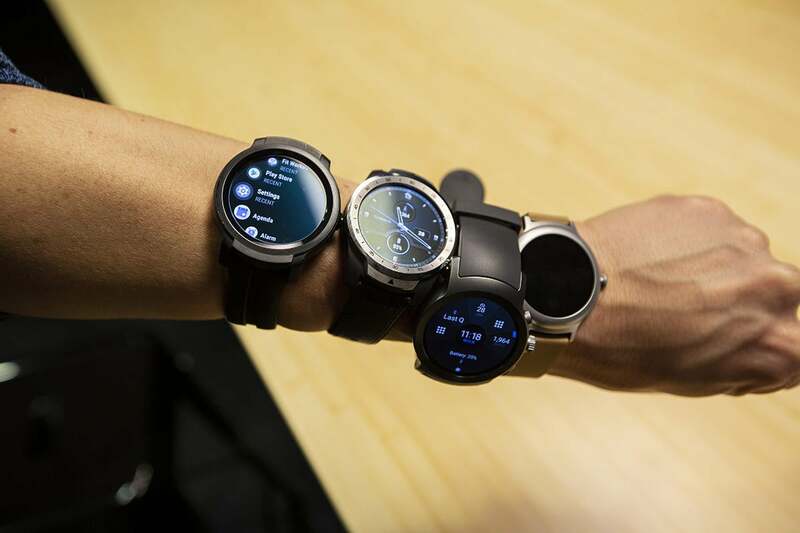 There’s nothing wrong with it that doesn’t also afflict every other Wear OS watch. And once it gets native sleep tracking, it’ll have a feature nearly every other Wear OS watch lacks. So while you probably won’t love the E2, you’ll definitely like it. And when it comes to Wear OS devices, that’s good enough.